Strength in U.S. equities is translating to strength abroad as emerging markets (EM) are gaining in 2019 after a 2018 to forget. Nonetheless, for investors who are still hesitant when it comes to international market exposure, now is the time with a possible trade deal between the United States and China looming as the main trigger event that could send EM through the roof. For EM investors who have stuck with the space for the last five years, 2019 can almost be seen as a year of retribution thus far. Core EM exchange-traded funds (ETFs) like the Vanguard FTSE Emerging Markets Index Fund ETF Shares (NYSEArca: VWO) is up 9.24 percent year-to-date after a 14.77 percent decline in 2018. 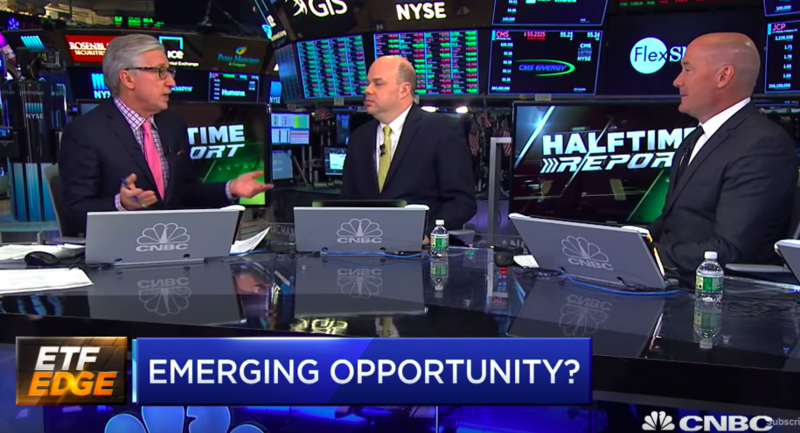 “Emerging markets have been unloved for the past five years,” said ETF Trends CEO Tom Lydon during an appearance on CNBC with Bob Pisani. Ongoing U.S.-China trade negotiations and geopolitical tensions put emerging markets in a state of unease in 2018, but investors can now look to their resurgence through other broad-exposure ETFs like the iShares MSCI Emerging Markets ETF (NYSEArca: EEM) and iShares Core MSCI Emerging Markets ETF (NYSEArca: IEMG). Investors are increasingly emphasizing low cost a prime motivator for allocating capital in 2019, which makes IEMG an attractive option. The fund provides this core EM exposure at a paltry 0.14 percent expense ratio. Other investors might want to only look at the cream of the crop in EM for initial exposure, which makes China the best alternative. This speaks to the adaptability of the ETF as an investment vehicle that can be used tactically. While investors are sifting through the plethora of opportunities the EM space has to offer, more advanced investors and short-term traders investors might look to play EM’s strength over developed markets. For investors looking for continued upside in EM, whether driven by a weakening dollar or continued developments around trade, the Direxion MSCI Emerging Over Developed Markets ETF (NYSEArca: RWED) offers them the ability to benefit not only from emerging markets potentially performing well, but from emerging markets outperforming developed markets. Conversely, if investors feel the exact opposite, the Direxion MSCI Developed Over Emerging Markets ETF (NYSEArca: RWDE) provides a means to not only see developed markets perform well, but a way to access a convergence/catch-up in performance of DM relative to EM. Direxion’s Relative Weight ETFs like RWED and RWDE offer investors the chance to capitalize on their confirmation bias by having a long-short component built in without having to spread their capital across different positions. China will no doubt be a major beneficiary if and when a permanent trade deal materializes and index providers like MSCI have been quick to act as barriers to entry for the once restrictive markets in the second largest economy begin to soften. MSCI Inc. announced it would increase the weight of China A shares in the MSCI Indexes by increasing the inclusion factor from 5% to 20% in three steps. The decision came after an extensive global consultation with a large number of international institutional investors, including asset owners, asset managers, broker/dealers and other market participants worldwide. “It’s all about liquidity and making sure you have enough of the underlying,” Lydon said, mentioning the Xtrackers Harvest CSI 300 China A ETF (NYSEArca: ASHR) as a way for investors to gain exposure to China’s biggest and best equities. ASHR is up 25.22 percent year-to-date and could also get another boost if a U.S.-China trade deal materializes soon.